Explore our historical views of Africa. 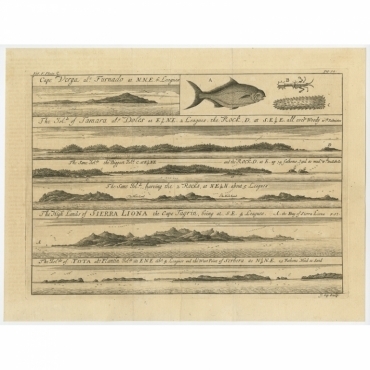 Our collection includes antique prints of coastal views of Africa, African landscapes, cities in Africa, ancient fortresses, African islands and more. 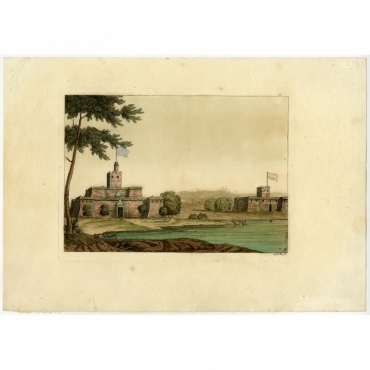 Antique prints of Africa from the 16th to the 20th centuries. Ontdek onze historische gezichten van Afrika. 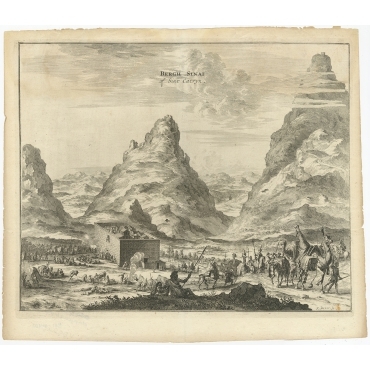 In onze collectie antieke prenten vindt u kustgezichten van Afrika, Afrikaanse landschappen, steden in Afrika, oude forten, Afrikaanse eilanden en meer. Antieke prenten van Afrika uit de 16e tot de 20e eeuw. Antique Prints | Africa There are 50 products. Antique print, titled: 'Algier.' - Caption in the top reads: 'In more periculum' (In delay danger). 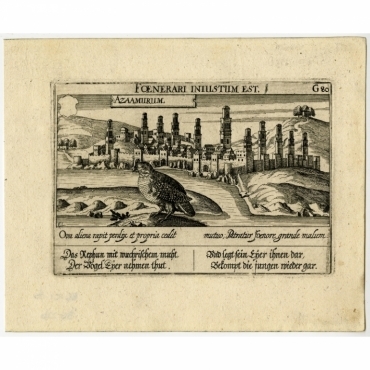 A view of the African city Algiers. A dog drinking from the 'Nile' in the foreground (Nile is according to caption). 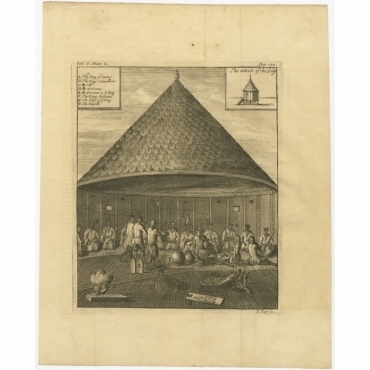 Antique print, titled: 'Azaamurum.' - Caption in the top reads: 'Foenerari iniustum est'. A partridge in the foreground, with the walled city (Azemmour in Morocco) behind. 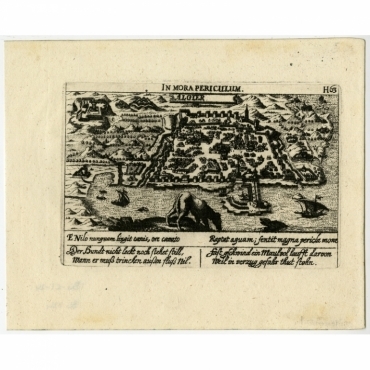 Antique print, titled: 'Prospect der Stadt Damiat.' - Tab VIII. 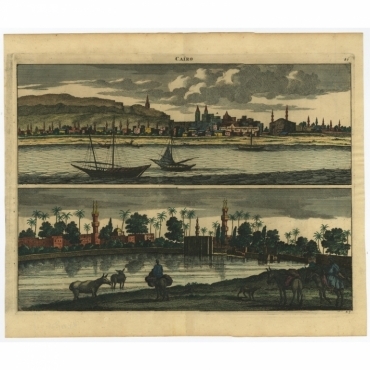 View of the city of Damietta, Egypt. Antique print, titled: 'Quiloa in Africa.' - Caption in the top reads: 'Non nisi contritus fulget' (Not unless broken shines'). Quiloa is nowadays known as Kilwa Kisiwani, an island near Tanzania. 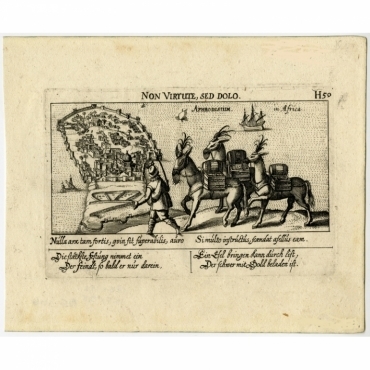 Antique print, titled: 'Nouveau Mexico.' 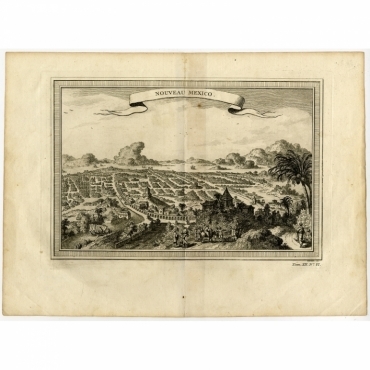 - A view of Mexico city in the 18th century. 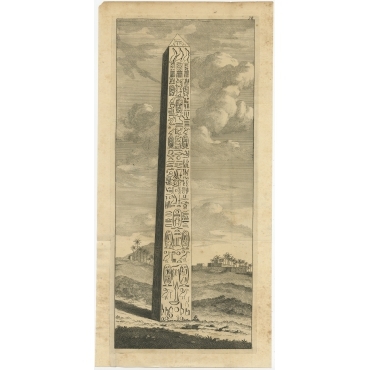 Antique print, titled: 'St. Helena.' 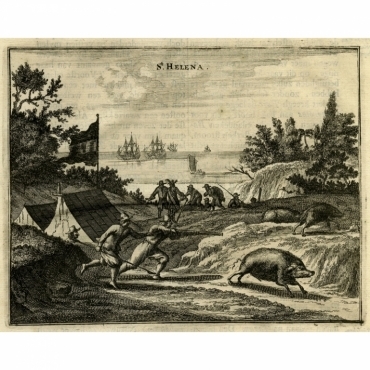 - A view of European explorers hunting boar on the island St. Helena. Antique print, titled: 'Sefale.' - A view of Sefale (identified in the text as Zofala, presently known as Nova Sofala, in the Sofala province of Mozambique). Antique print, untitled. 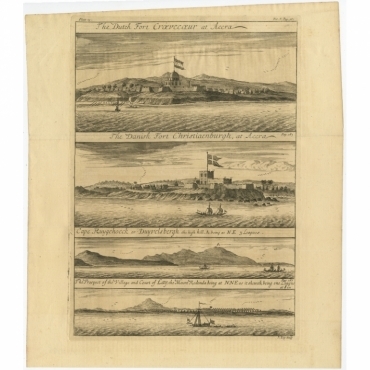 A coastal view with two forts (one English, the other Dutch), probably on the Gold Coast in Africa. 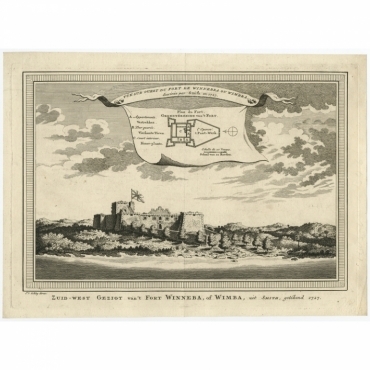 Antique print, titled: 'Zuid-west Gezigt van't Fort Winneba, of Wimba (…)' - South-West view of the British Fort Winneba or Wimba, Ghana, Africa, with plan. 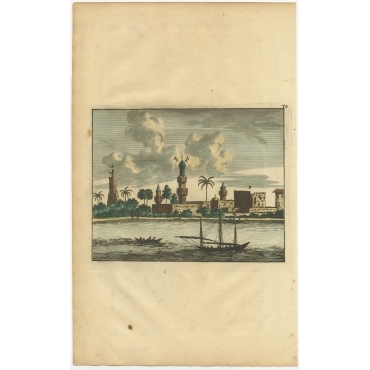 Antique print, titled: 'Cairo' - Two views of Cairo, Egypt. 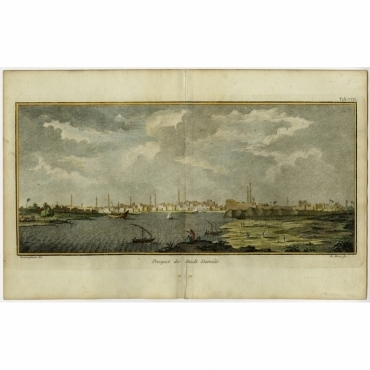 Antique print, titled: 'Rio Galinhas … Rio Corso (…).' 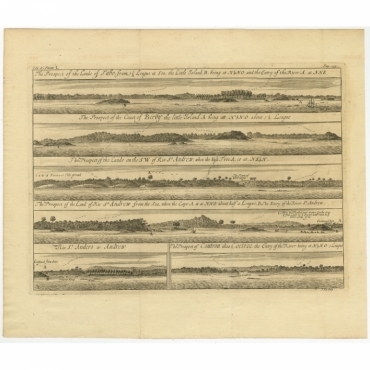 - This plate shows several views of the Liberian coastline between Rio Galinhas (west of the Nun river) and the river Cess. 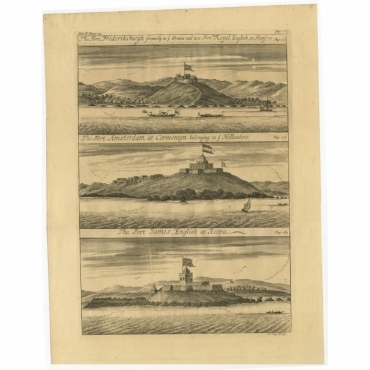 With Cape Mesurado (present day Monrovia) in between. Top left, inset, a drawing of a kola nut. 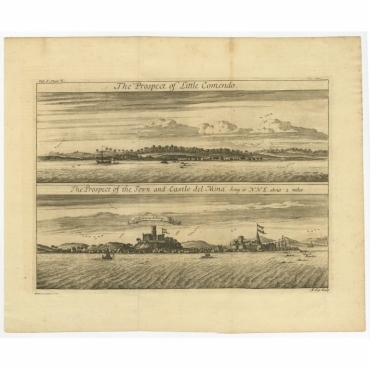 Antique print, titled: 'The Prospect of the Lands of Tabo … The Prospect of Coutrou alias Coetroe (…).' 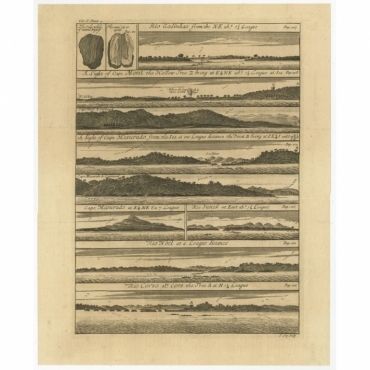 - This plate shows views of the Guinea coastline, between Tabou and Kootrou on the Ivory Coast. Some notes, two sailing ships and several canoes. Antique print, untitled. 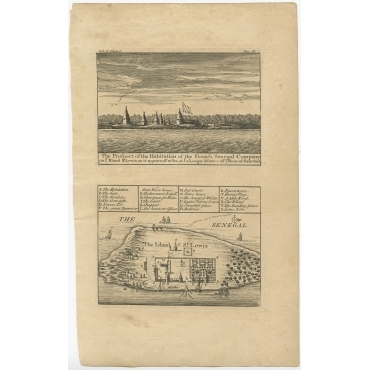 This plate shows the Court of the King of Sestro, Liberia, Africa, published in Churchill's 'A Collection of Voyages and Travels, some now first printed from original manuscripts others now first printed in English', printed in 1744 for Henry Lintot.